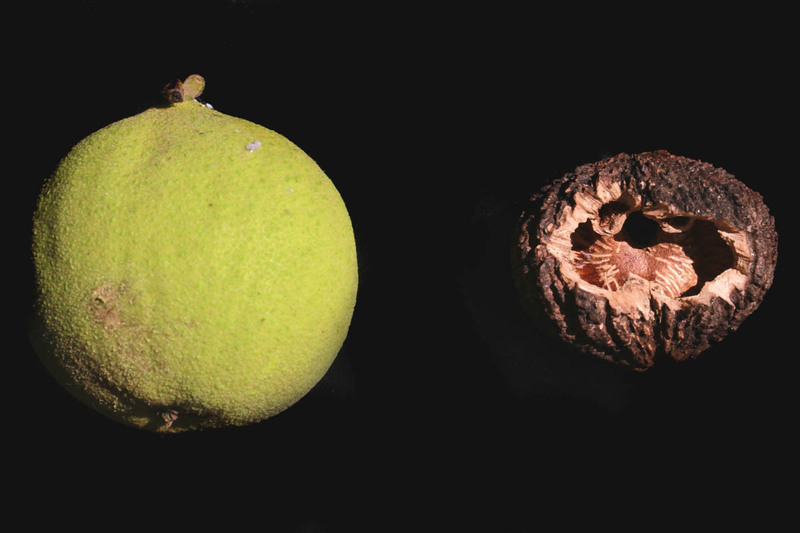 Even though a late spring frost may have reduced this year’s crop of Black Walnuts (Juglans nigra), and even though the few that made it haven’t started falling on the ground yet, squirrels have already located and started consuming this nut’s fatty meat. Inside the green husk is the actual nut, and if you look closely at the edges of the chewed hole as well as the inner surface of the nut, you will see tiny incisor marks, most likely left by red squirrels. This particular rodent typically chews a hole on both sides of the nut, so that it can gain access to both halves of the meat. 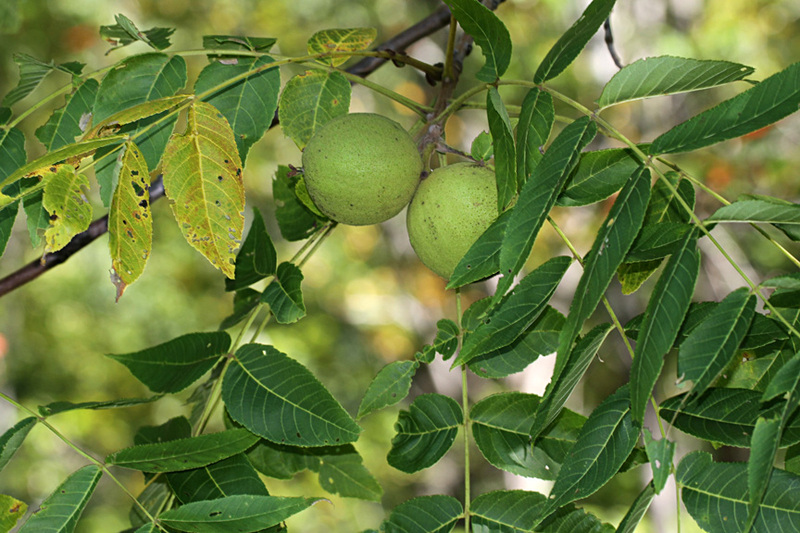 Black walnut (Juglans nigra) is one of the most sought-after native hardwoods. It has been heavily logged for its fine, straight-grained wood which has been used to make furniture, gunstocks and flooring. Because it is becoming increasingly rare, black walnut today is used primarily for veneer. The fruit of this tree is also highly prized, both for its meat as well as its shell, which is extremely difficult to crack, as anyone who has tried to do so by hand knows well. Because of this hardness, the shell has a number of commercial uses, including metal cleaning and polishing, oil well drilling, paints, explosives and cosmetic cleansers. If you would like to sample the sweet nut inside this shell, and are fortunate enough to know the location of a fruiting tree, the trick is to beat the squirrels to the nuts. After the first hard frost, collect the nuts. Eventually the green husks turn black and soften. After rinsing the nuts under water to remove the husks (beware that the husks are a natural dye and will stain your fingers), keep the nuts dry in a cool spot. The biggest challenge comes when you wish to extract the meat – commercial production involves running the nuts between two steel wheels. Barring that method, a hammer seems to do the trick.